You are here: Home / Corporate / What a winner of a week! 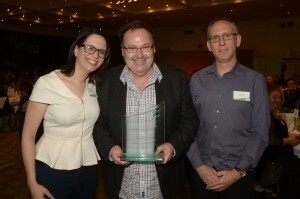 This week our VET LMS product scored a major award from the national eLearning body and I was surprised, almost shocked. Why? Well … Our product has more VET specific functionality than any other LMS I’ve seen, by far. Even with my Rose-tinted-glasses places firmly between the smartphone and tablet device on my cluttered desk, I know we really are the best LMS for the VET sector. The international ‘Big Guys’ may have more functionality in some areas however we have far more VET specific functionality, more RTO nuances and pricing our sector can afford. So why was I so surprised? The bottom line is we are the back-room team for our clients, our product is the delivery platform for the good the bad and the brilliant of eLearning content. We are the middle ground between our clients’ websites and their student records systems. We are by design, as invisible as we can be for students. Our user interface and a good deal of our technology is firmly focused on learning outcomes. As I scan the media, conferences and websites, so much of what I have see is focused on pretty pictures and marketing spin whereas we are firmly focused on trying to deliver back-room brilliance. To find out more about the Award Winning VET LMS, watch the video, follow this link, call me (John Wooding) on 02 8596 7676 or our LMS Product Manager, Troy Kenah on 02 8596 7602. A great night! Well done to everyone!